A group of women from Southborough are working together to make a difference. To make a real impact, they are seeking power in numbers. 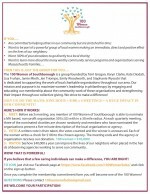 The charitable group is hoping to round up enough members to justify their name – 100 Women of Southborough. To join, you just need to be willing to commit to donate one hour of time and $100, four times per year. The group is founded by Terri Grogan, Karyn Clarke, Kate Diodati, Lisa Fruhan, Jamie Mieth, Jen Triompo, Emily Woodworth, and Stephanie Wysocki. Grogan explained to me that she learned about the “100 women” concept through work. She was inspired to start a Southborough group and recruited her co-founders. dedicated to supporting the work of local charitable organizations throughout our area. Our mission and purpose is to maximize women’s leadership in philanthropy by engaging and educating our membership about the community work of these organizations and strengthening their impact through our collective giving. We strive to make a difference! The first meeting will take place this September (date TBD). In preparation, the founders are reaching out to recruit members. As of earlier this week, their Facebook page updated that they were 3/4 of the way to meeting the 100 member goal. THEN THIS IS JUST THE GROUP FOR YOU…. JOIN US! DO THE MATH: [ONE HOUR + $100] x 4 MEETINGS = A HUGE IMPACT IN OUR COMMUNITY! 1. 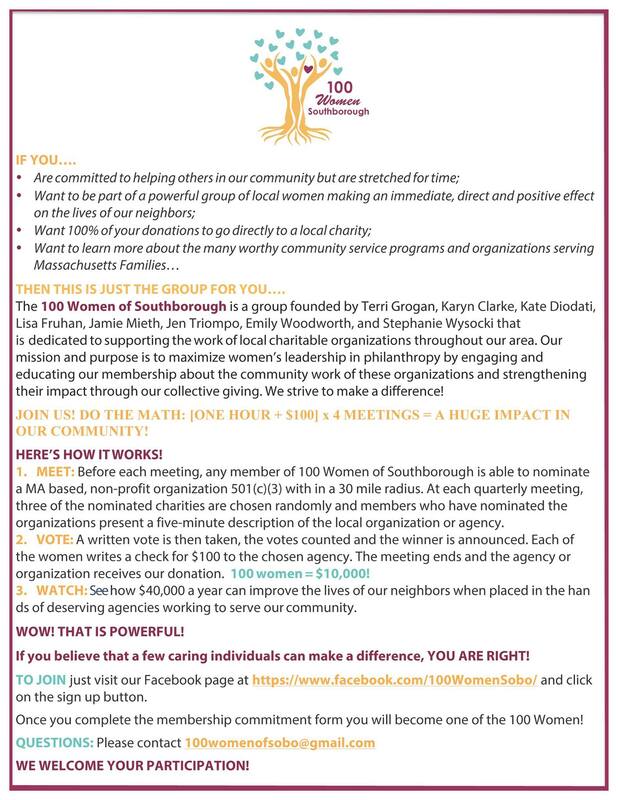 MEET: Before each meeting, any member of 100 Women of Southborough is able to nominate a MA based, non-profit organization 501(c)(3) with in a 30 mile radius. At each quarterly meeting, three of the nominated charities are chosen randomly and members who have nominated the organizations present a five-minute description of the local organization or agency. 2. VOTE: A written vote is then taken, the votes counted and the winner is announced. Each of the women writes a check for $100 to the chosen agency. The meeting ends and the agency or organization receives our donation. 100 women = $10,000! 3. WATCH: See how $40,000 a year can improve the lives of our neighbors when placed in the hands of deserving agencies working to serve our community. If you believe that a few caring individuals can make a difference, YOU ARE RIGHT! TO JOIN just visit our Facebook page at https://www.facebook.com/100WomenSobo/ and click on the sign up button. Once you complete the membership commitment form you will become one of the 100 Women! My question is will you be inclusive for exclusive to only help females? Seems sort of short cited as females are way ahead of the curve on entering college, graduating from college, earnings masters degrees and from graduating from top schools and on average they’re making as much if not more than men. By in large, most opioid and heroin addicts are men although there is an increase with females as well. It seems to me that mothers would want to help the boys and the young men increasingly struggling across the region. I’m sure here in Massachusetts liberals want to be inclusive would approve of your mission. Where in the description did you get that impression? I can’t see it anywhere. It only mentions helping our neighbors. Even though I am female, I recognize the gender diversity of my neighbors. Freemasons, Lions Club, Knights of Columbus, Elks, etc, etc. how about equalizing clubs that your own gender keeps exclusive first? Can only imagine who you voted for last election. What is your charitable classification, for tax accounting purposes? The 100 group doesn’t receive the funds. The process outlines that 4 times each year, each member makes a check out directly to charity that is selected by vote.